I named this quilt ‘The Between Quilt’ because it was rather unplanned but necessary. It was wedged ‘between’ the last quilt and the next. This quilt helped me survive the transition of becoming an empty-nester when our only hatchling left the nest and moved out-of-state. 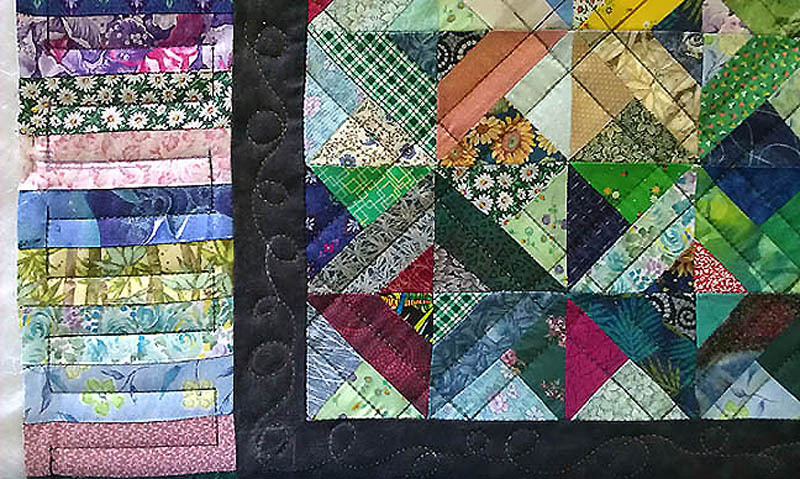 The Between Quilt pattern is from Bonnie K. Hunter. Her’s is named ‘Hidden Pinwheels’. Mine is about 50/50% hand and machine pieced and 100% hand quilted. The machine work utilized an early 1970’s Kenmore sewing machine. 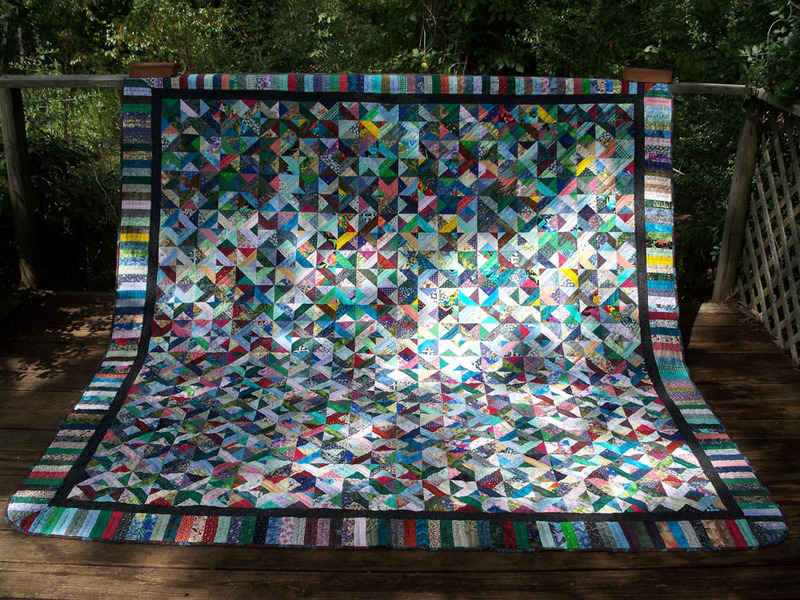 The quilt has a 2″ black inner border, piano keys outer border and is backed with ecru printed wide fabric. The corners are rounded and the binding was applied by hand. It is hand quilted using ecru YLI and Gütermann threads. No new fabric was harmed while constructing this quilt. Only the backing was purchased….all other fabric came from my stash. When I asked DH for advice on how I should quilt the black inner border, he suggested ‘scrolls’. I misunderstood him (he mumbles) and thought he said ‘scribbles’ which explains the loopy doodle quilting. This is the fastest I’ve ever hand quilted a queen plus size quilt. It was in the frame for 5 months.